Libourne, 7th March 2016: Ceva Santé Animale has today posted growth of 11.9% constant perimeter and 10.4% at constant exchange rates for 2015 on turnover of 857 million euros. Its performance moves it up the table of animal health businesses to number 7, and continues its record of posting double-digit growth every year since the Group’s formation. The results show that Ceva is once again one of the fastest growing in its sector, as it looks to become the largest animal health business in France once the merger between Merial and Boehringer Ingelheim takes effect. Ceva recently acquired Polchem, an Indian Veterinary business specializing in the avian and dairy sectors. 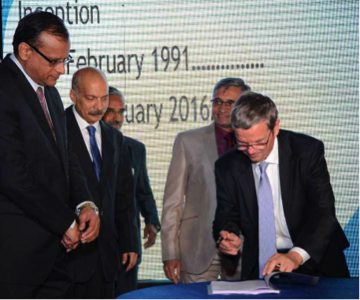 This marks Ceva’s entry into this important global market with India being the world’s largest milk producer and the fifth largest poultry producer. Based in Pune, 160 km southeast of Mumbai and founded 25 years ago by Nitin Sahasrabudhe, a chemical engineer and Milind Lamaye, veterinary microbiologist, the company has built a strong reputation in the poultry and dairy sectors. It has its own production facilities, R&D and laboratory facilities and currently employs 270 people, including several veterinarians. Under the proposed deal, both partners and the management team will remain in place to drive forward the expansion of Polchem’s flagship lines in (disinfectants and food supplements) and to develop sales of Ceva’s innovative poultry vaccines and ruminant products in India. "India is a country too strategic to ignore, but we did not want to integrate our operations in this market before finding the right partner to assist us. Polchem ​​shares our values ​​and have the right team to bring our products to this important market." added Dr. Marc Prikazsky. Sales grew across all regions. In terms of species markets, poultry experienced significant growth (+ 24%), boosted by strong demand for Vectormune® ND and Transmune®, Ceva’s innovative avian vaccines. Alongside geographical expansion, the launch of new swine vaccines, especially Coglapix® (pleuropneumonia) and Hyogen® (mycoplasma) and the recent launch into the US swine market, marks the beginning of a new cycle of growth to support the Group’s ambitions. A key part of Ceva’s recent success is becoming the third largest producer of poultry vaccines globally and in avian biology more broadly, being the largest producer in Brazil and second-largest in the USA. In addition to providing innovative vaccines, the group advocates early vaccination in hatchery (in-ovo or day-old chicks) to promote better chick welfare. Ceva already provides a complete hatchery vaccination service to its customers and in the light of further growth opportunities in this part of the market Ceva has acquired two companies in France: Ecat in 2013 and iD Projects (1 March 2016). The merger of these two companies will help create a global leader in automated and in-ovohatchery vaccination. Amodip® is the first treatment for feline hypertension, a chronic disease that can cause serious lesions in organs of cats. This drug represents a breakthrough because for veterinarians who were obliged to prescribe “off-label” a drug designed for humans. Launched on the European market in early 2016, Velactis® is the first and only facilitator for dry-off in dairy cows. This innovative drug improves the udder health and welfare of dairy cows while helping farmers in the management of a crucial period in the dairy production cycle. Dr Marc Prikazsky said: "Velactis® is a major breakthrough. We hope this will become an essential management tool for dairy farmers."